Welcome to our very own RTIC cooler review! If you are a hiker, camper or outdoorsman who just needs a cooler that can handle your extended trips, the last thing you want to worry about when you are in the woods is your food supply going bad because of a faulty cooler. While there are options out there, what you really need is something durable and well-constructed that can retain ice for long periods of time. Sure, the names that you are used to are companies like Yeti or Orca, or Pelican coolers, BUT they do come with a price tag. With their strategic and aggressive advertising, there’s a good chance you have already heard of them. Now, before you make a decision there are some things you need to know. 34.12" x 17.25" x 14.12"
41.62" x 20.87" x 20"
There are many great qualities and features that come with the line of RTIC coolers. Here is anything and everything you will need to know before making your next buying decision. 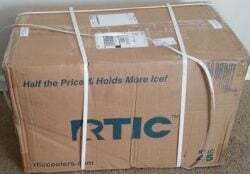 The RTIC cooler is literally ready right out of the box. Once you open the box it is shipped in, you will find it in a plastic bag that covers it completely. This is probably done so to help prevent scratches, but you’ll find it to be durable enough to withstand the shipping transport. It is fully assembled with the T latches, rope handles and feet. This truly makes it ready to go once you open the box. It can go directly from the box to your vehicle or anywhere else. No assembly required. Nice. There’s a term that you may have heard of when you read up on high quality coolers – Roto Molding. It’s a method of molding that ensures the highest quality and one-piece cut. When it comes to coolers, this is a must. With an RTIC ice chest, you’ll find this process in their cooler creation. It calls for an exact cut and thickness within the wall, as well as all around the cooler which produces no imperfections. You may be wondering, what’s the big deal? With a variety of sizes to choose from, you’ll be able to provide an option for the individual weekend warrior or even larger groups going on a camping trip. But just how long will the ice last? With the roto molded walls, you’ll find two inch thick polyurethane foam insulation, with lids up to three inches thick. The cool lift design will keep your cooler above hot surfaces giving you the best possible ice retention time. Okay, so this is probably what you wanted to know, right? How long will RTIC coolers hold ice? According to their website, you can expect ice retention times of up to 10 days. Talk about a portable freezer. When it comes to RTIC coolers you’ll be able to find one for every occasion. On the smaller side is the RTIC 20. 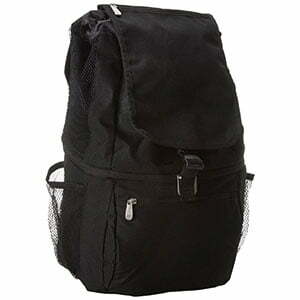 This is perfect for the individual or just a few people who may need drinks and food kept cold for a short trip. 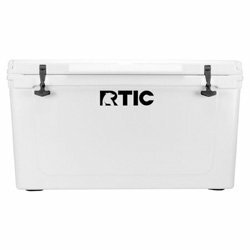 The RTIC 20 weighs in at 17.5 pounds and comes in at an outer measurement of 17 ¾” x 11 ¼” on the bottom side of the cooler and 20” x 13 ¾” on the top side of the cooler. It stands at 15” and will fit comfortably in your back seat. It can hold 24 cans or 25 pounds of ice. In pure liquid form, you will have ample room for 22 quarts or 5 and a half gallons. A step up from the RTIC 20 is the nicely built mid-size RTIC 45. 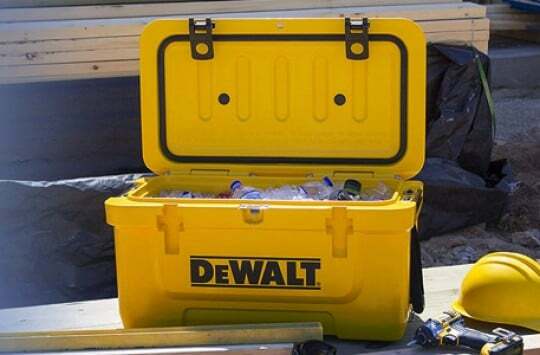 Not only will this cooler be able to store food and drinks, but it will be perfect for hunting and camping, especially for smaller game. 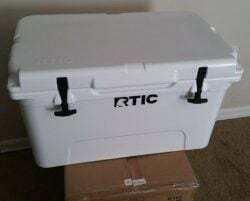 The RTIC 45 weighs in at 25 pounds and comes in at an outer measurement of 25 ¼” x 13 ¾” on the bottom side of the cooler and 26 ½” x 16 ½” on the top side of the cooler. It stands just a shade under 16” and will fit comfortably in the back of your pickup truck or tailgate. This cooler can hold a case and half of cans (36) or 40 pounds of ice. You can also fill it with 45 quarts or 11.25 gallons of liquid. The beauty of the RTIC 65 is that it can accommodate a large group of people, yet it can be handled and picked up by one person. However, having two people carry it may be a safer bet. 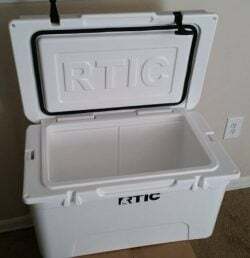 The RTIC 65 weighs in at 36.5 pounds and comes in at an outer measurement of 30 5/8” x 15 ½” on the bottom side of the cooler and 32 ¼” x 18 ½” on the top side of the cooler. 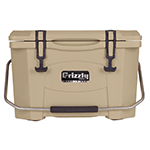 It stands at 17 1/8” and is perfect as a party cooler, on rafting trips and functions well if you are hunting bigger game. It can hold several cases of cans (64) cans or a whopping 70 pounds of ice. If you are filling it with liquid, you’ll find that you can easily fill it with 65 quarts or 16.25 gallons. 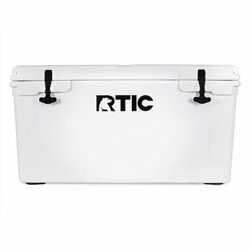 The RTIC coolers come in three colors: Arctic White, Mojave Tan and Ocean Blue. There are many different features that make RTIC coolers attractive for the prospective cooler buyer. An RTIC Cooler Review would be incomplete without speaking about some key features. We’ll dive in a little deeper here starting from top to bottom. 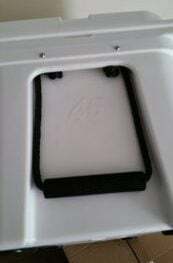 If latches break or aren’t very user friendly, then it renders the cooler ineffective. Instead of skimping on the latches, the RTIC cooler ensures that you are cared for. The T Latches lock into place and stay in place to handle different conditions that it may be exposed to. The “T” design stays put in the body of the cooler and make it easier to grip and handle (no pun intended), when it comes time for you to grasp it when you want to open up the cooler. The durable silicone it is made out of ensures that they won’t corrode over time and heavy use. It’s useless how great your cooler is if it can’t keep the cold air in and hot air out. Around the lid of the cooler you will find a freezer grade gasket measuring ¼ inch wide and ¼ inch thick, that not only seals off the cooler to keep contents colder for longer periods of time, but also prevents leakage. Small sections on the edge of a lid won’t do if you have a vacuum sealed cooler. In fact, it can get extremely difficult to open if there isn’t much room for you to work with. The edge of the lid of the RTIC cooler extends ½” past the edge of the cooler ensuring that you have more than enough room to grasp and open. While the T Latches keep the lid in place and make it easier to “unlock” the lid, the extended easy lift handle makes sure that you are using the lid to open it up and not the latches, which can be seen amongst some other coolers. If you will be venturing off road or anywhere that will cause your cooler to bounce around, then you will really enjoy the molded tie down slots. These sections on the side of the cooler make it a breeze to secure your trailer to your transportation – be it a truck bed or even a boat. You get to choose how you want to carry your RTIC cooler as you will find two types of handles. One set is a molded in style, while the other is a rope handle. Depending on how heavy your cooler is, you can decide how you want to carry it by using one of these two handles. A full-length hinge system ensures that the lids of the RTIC cooler doesn’t over extend or separate from the rest of the body of the cooler. The strength of this system cannot be overstated, as a lid that gets separated from the rest of the cooler is not really one that you want to be depending on. This is especially the case if you are gone on an extended trip. For those outdoorsmen that may need to use a cooler as a platform to stand on, they will find the non-slip surface of the RTIC cooler to be ideal. Add in a locking system and you have just added in another layer of security to not only keep everything in your cooler secure, but also to help keep the lid in place should you need it to do so. As mentioned earlier, the 2” to 3” thickness you’ll find around the cooler will keep frozen ice for up to 10 days. While the freezer grade gasket will seal it off to allow your RTIC cooler to function as a portable freezer. Another feature that you may find attractive is the compatibility of the RTIC ice chest with dry ice. Should your needs call for dry ice, you’ll be happy to know that RTIC coolers will allow you to use just that. In fact, in our recent post, we recently picked RTIC as one of the best dry ice cooler. At the end of the day, you’ll need to clean and drain your cooler. This can become a problem if it doesn’t drain properly, but RTIC has already taken care of this for you. This two-step system calls in the easy flow drain to make quick draining possible, as well as a rapid V drain which will allow for complete draining with a recessed V-Drain. Specially designed feet keep the cooler off of the ground AND off of hot surfaces, to give the RTIC cooler the best possible chance to stay as cool as possible, even in the hottest conditions. As is the case with many coolers, RTIC coolers have done their best to join the “bear proof coolers club“, making their coolers ready to protect bears from accidentally eating contents and the actual coolers themselves. The special roto molded design helps to make sure of that. Who Is The RTIC Cooler For? 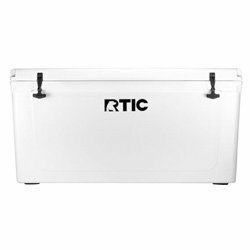 The RTIC 20 is ideal as a personal cooler. If you are working at a job site or just off golfing with a few friends, then this will be perfect for you. It will also function well for a weekend trip or if you plan on camping by yourself or with another person. The RTIC 45, as big as it is can still be carried by one person. 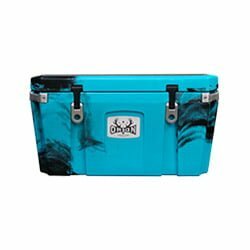 This mid-size cooler is ideal for a fishing trip, if you are camping or even tailgating at the next big game. 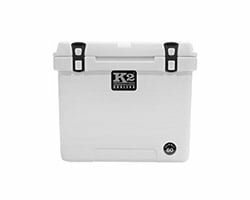 Speaking of game, this cooler also functions well should you decide to hunt small game and need to store it. The RTIC 65, as large as it is can also be carried and handled by one person, though you may want to get an extra hand. 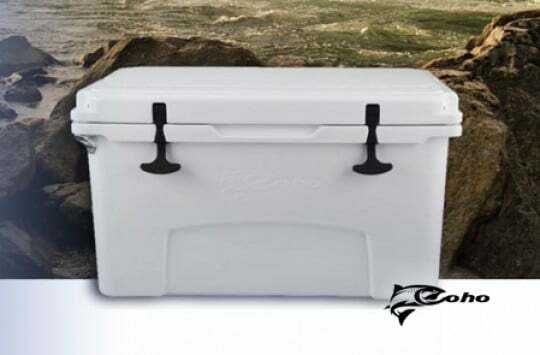 This cooler will be an excellent marine cooler, will work great on a hunting trip or even for longer camping trips. You can use it potentially as a backup refrigerator, for parties or even when hunting bigger game. RTIC Reviews – What Are Actual Users Saying? This is where we get down to the nitty gritty to see what actual users are saying. One user shared that they liked the build and ice retention time of the RTIC cooler. The user mentioned still having ice after 14 days, which goes well beyond the manufacturer’s claim. The user also mentioned using the cooler as a step stool which spoke to the non-slip lid. A user commented that they liked the build of the cooler and that they seemed to be well made, but the one thing that they didn’t like was that the warranty was only good for 30 days. While that may sound like a short amount of time, the one thing that needs to be factored in is the tremendous cost savings that come into play as opposed to some similar coolers on the market. Another user mentioned still having ice in the RTIC 45 after four days and was pleased with the product. However, the user did mention seeing some others comment on the drain plug not being insulated and provided a solution which was to place a wine cork in it as a perfect fit and fix. 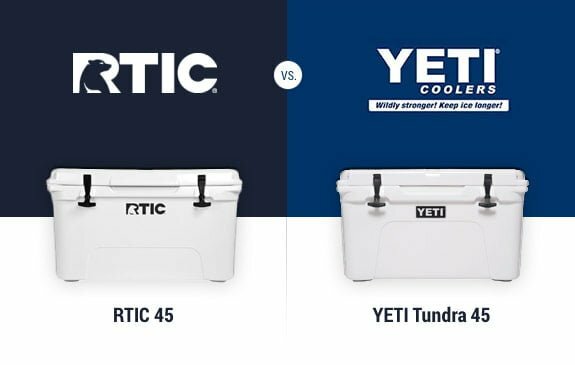 RTIC vs. Yeti Coolers – Which One Is Better? Choosing between RTIC vs Yeti isn’t easy, as both brands have a lot to offer, so before you make a decision it’s worth to compare both choices. We’ll announce our winner in a second, but before we say which one would be our choice, let’s briefly compare both ice chest lines. Here we go. Weight: 17.5 lbs. 15 lbs. Weight: 25 lbs. 23 lbs. Weight: 36.5 lbs. 29 lbs. Here’s a look at what you can expect as far as actual “usable space.” These are directly from the manufacturer’s site. 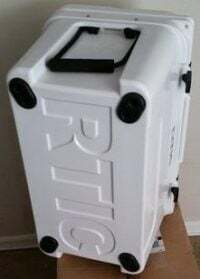 The RTIC 20 can hold 24 cans or 25 pounds of ice, while the Roadie can hold 16 cans or 20 pounds of ice. It’s 22 qt vs 20.8 qt. The RTIC 45 can hold 36 cans or 40 pounds of ice, while the Tundra 45 can hold 28 cans or 34 pounds of ice. It’s 45 qt vs 37.6 qt. The RTIC 65 can hold 64 cans or 70 pounds of ice, while the Tundra 65 can hold 42 cans or 52 pounds of ice. It’s 65 qt vs 57.2 quarts. When it comes to Yeti vs RTIC ice retention, the numbers can be all over the place. For one thing, conditions matter as well as how the individual using it will matter. 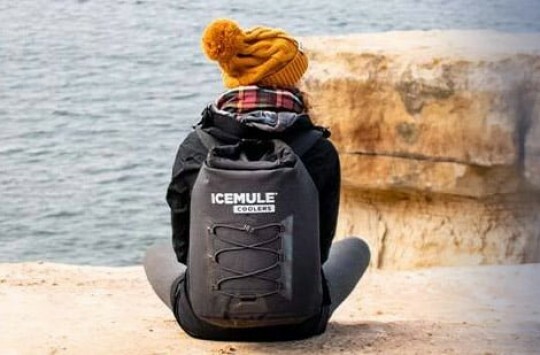 For instance, taking a cooler on a camping trip in the hot sun will affect the ice retention time, as well as how the individual packed the contents, in addition to how often it is opened up. There is a big difference as far as ice retention times between a cooler staying shut and only being opened once a day, as opposed to being opened several times throughout the day. Again, there are many things that factor in to the actual Yeti vs RTIC ice retention times. The numbers you will see online from past users will also vary, as some have reported several days of frozen ice, with others reporting up to two weeks with frozen ice. According to the Yeti website, they make no claims of how long ice retention times will last, also citing the conditions and user as variables on time. On the other hand, RTIC claims on their website, ice retention times of up to 10 days. It’s worth noting that the user above mentioned it exceeding that time at a duration of 14 days. While the numbers may vary from cooler to cooler, condition to condition and person to person, what you can expect is at least a few days of ice, as long as you are not careless in the use of the cooler. When you look at the two coolers side by side, they are very similar when it comes to build, quality, and design. They are very near to each other. When it comes to big purchases like this one, many often will choose the premium name brand over the rest. If you tend to gravitate towards a premium name brand and can afford the costs, then you may lean more towards the Yeti line up. However, if you are looking at this from a different standpoint, one where cost and pure value for your money comes into play, then we would recommend the RTIC. Again, please keep in mind that the reason we are saying this is from a purely cost based point of view, but in our opinion, this is precisely what makes RTIC a winner in our RTIC coolers vs Yeti coolers battle. Another reason you may want to pick RTIC up today is because they will only be around for a limited time. Dues to a recently filed lawsuit by Yeti, RTIC will be selling off the rest of their inventory and creating a new line of coolers. This could bring about even further cost savings as they look to sell their inventory. We are not saying this will happen, but there may be a chance of it happening, which would be to your advantage. Where To Buy RTIC Coolers? According to the RTIC website, they are a direct-to-consumer brand which means you won’t see their products in any stores or at any dealers. 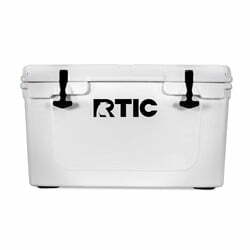 To get your hands on an RTIC cooler you can order it directly from their website. We will let you in on this little tidbit though, they have been spotted on Amazon, and also at a lower cost. So, if you get a chance, before you start frantically searching where to buy RTIC coolers, check out Amazon right here. If you can’t find what you want there first, then head over to the RTIC site. When you purchase a cooler, that’s pretty much it, right? Not with RTIC coolers. There are several accessories available that can transform your RTIC cooler into much more. For example, say that you are going on a hunting trip and need to store some of your catch in the cooler, but still want to store some of your food and beverages. It’s probably not the best idea to have your sodas and sandwich meat mixed in with some freshly caught salmon, which is when you’ll need a divider. The RTIC 45 and RTIC 65 offer dividers (here and here, respectively) to help turn your cooler essentially into two. You’ll be able safely to separate your catch from your food supply. If you’d rather suspend items when it comes to separation, you can also pick up baskets that come in the sizes mentioned above as well. Need an extra drain plug or found that one of the feet went missing on your cooler? No problem, you can get extras here as well. Oh, and did we mention we recently posted the RTIC koozie review, which can be a nice addition to the ice chest (although it’s not an accessory per se, but a standalone product). The beauty of this is that you aren’t just bound to RTIC branded accessories. You can also check out some third-party sites that offer other add-ons and accessories for the RTIC cooler line, one being Amazon. When it comes to quality, build, size and ice retention times, the RTIC brand of coolers matches up extremely well with other similar coolers on the market. Where it differentiates itself is in price. We hope that this genuine, first-hand RTIC Cooler review has shown you everything you need to know before you make your purchase. For the price and quality, you truly can’t go wrong so if you’re thinking of purchasing a cooler then RTIC is a right choice. But don’t take our word, read thru these first hand reviews on Amazon. We just bought a 65 qt. and a 20qt. RTIC cooler and would have gotten the 45qt. if it had been in stock. We camp every month and kayak and scuba dive so we needed coolers that could keep up with our lifestyle and did not want to pay “That” much for a Yeti. On our first camp trip with the 65qt. RTIC we put two 16lb. bags of ice in the night before we left and that ice lasted 8 days!!!!!!!!! Hope the RTIC stays afloat in the market…Thanks, 2 very happy cooler people. I have the 20 can soft cooler and it’s junk. I have used my cooler maybe 10 times. It looks brand new and the zipper won’t zip. I contacted customer service and they said it was out of warranty by 2 months. I requested the owners of the company to contact me and they will not. When comparing these coolers to yeti all I can say is you get what you pay for. Buy cheap and you get cheap. Save your money and buy a good cooler! Don’t waste your money on this piss poor cooler!